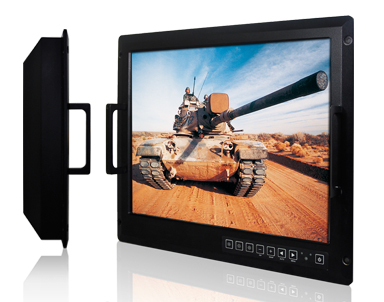 Winmate’s 20.1” Military Grade Display, R20L100-RKA2ML, is designed for military application by offering military grade power connector and being certificated with MIL-STD 810F/G and MIL-STD 461E/F. Its 1600x 1200 display provides outstanding performance in terms of brightness, contrast ratio, and viewing angles. The main features of this display include military grade power connector model JY27466 for AC isolation power input; flush mount mechanical design provides easy on-vehicle installation; convenient on-screen display controls with auto-dimming and dimming controls makes easy adjustments for display and stable light output during day and night operations and capable of displaying multi-source input data includes 5 x BNCs (R,G,B,H,V), VGA, DVI-D; and optional 5-wire resistive touch sensor is equipped with EMI mesh coating as RS-232 touch interface. The sample of the Military Display will be shown in two international military and defense exhibitions within the following two months. The first one is Taipei Aerospace & Defense Technology Exhibition (TADTE) in Taipei, Taiwan, in 11-14 August. In terms of European show, Defense & Security Equipment international (DSEi) will be held in London, the United Kingdom in 13-16 September. In addition to military standard display, Winmate will exhibit its rugged tablet and handheld series in both booths.